Our high-barrier 4.5MIL M-seal bags are constructed from high barrier foil and are designed to protect coffee from water, oxygen, and light. They are a quad seal style with a bottom V-seal for extra strength.They are FDA approved and BPA free. These bags will hold approximately 12 – 16 oz of dark roasted coffee and measure 3.5″ x 15.5″ x 3″. These bags feature a V-seal on the bottom for extra strength. These Mylar bags will only work with chamber-style vacuum sealers or impulse (heat) sealers. They CAN NOT be vacuum sealed with FoodSaver or Seal a Meal machines. If you have any questions, please send us an e-mail or call us at 661-332-5631. CASE QUANTITIES SHIP FOR FREE! HIGH-BARRIER SILVER MYLAR BAGS. 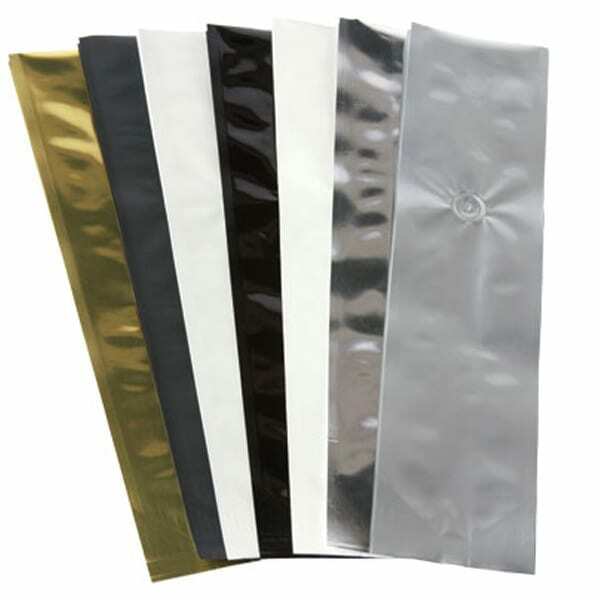 Our high-barrier 5MIL Mylar bags are designed to protect your items from water, oxygen, and light. FREE SHIPPING ON CASE QUANTITIES! 100CC OXYGEN ABSORBERS FOR USE WITH QUART SIZE MYLAR BAGS. Our oxygen absorbers can remove oxygen from your bags down to about .1% to protect your food from spoilage.